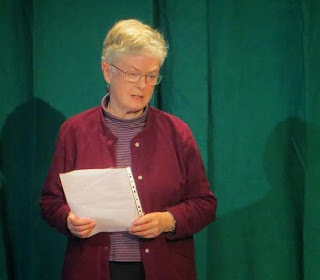 I would love her was commended and here I am reading at the awards event in March 2014, though somewhat dazzled by the stage lights! It took place at the Friargate Theatre, a cosy place which hosted all the winners. And what a lovely bunch of readers and poems we heard - it does make such a difference when you hear poems and see them on the page. This poem, inspired by an encounter on Headingley rail station platform, is here for you to read (scroll down low). The station stands higher than the surrounding allotments and houses - all were covered in deep snow. A snow figure had been neatly built on one of the red metal seats. No one else was around when I arrived and all was eerily quiet.